New generation in rotary phase control panel design. Use this panel in conjunction with a three phase idler motor, with this setup you will have a CNC rated rotary phase converter, that can be use for voltage sensitive equipment or just standard equipment. The three phase idler motor should be rated at 230 volts and a rpm of 17XX ( 4-pole ) or 34XX ( 2-pole ). The Gold series has better voltage and current balancing features plus lower start-up and idle current, as compared to other converter panels are the market today. Built-in push button start-stop station with this setup your phase converter can not self start itself if there was a single phase power loss and the power came back on. You would need to repress in the start button to restart the phase converter. Heavy duty oil filled run capacitor three bank circuit design, for better voltage and current balancing between phase’s. Voltage sensing relay that controls the starting circuit of the phase converter. 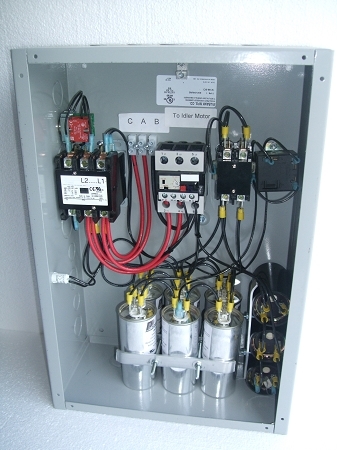 Power contactor that controls the start capacitor circuit. Terminal block that provides connection for your three phase output load.